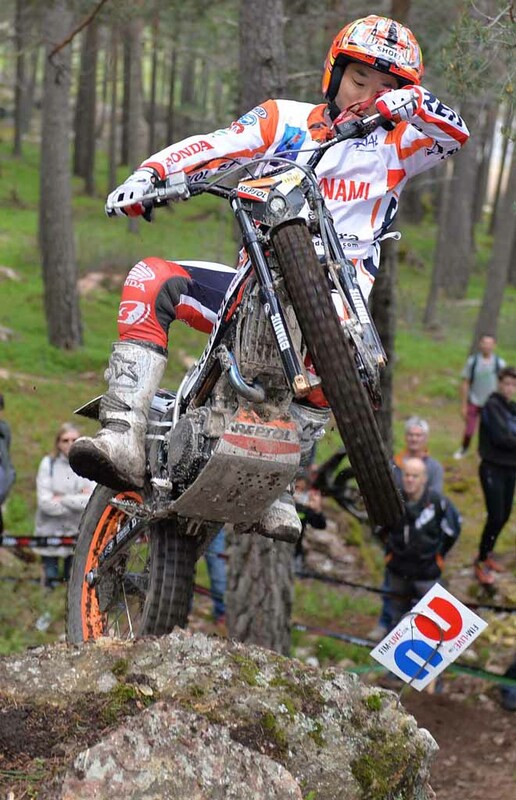 Today saw Toni Bou – Repsol Honda extend his winning run to four in a row as he took a hard fought victory on the opening day of round four of the 2016 FIM Trial World Championship held in Sant Julia de Loria, Andorra. As has so often been the case over an extended number of years, Bou had to fight off the close attentions of his main rival, Adam Raga – TRS who scored back-to-back wins in the small principality last year. Two laps of eighteen sections set on the steep sided valley took their toll on the field as heavy overnight rain left the hazards in a treacherous state. 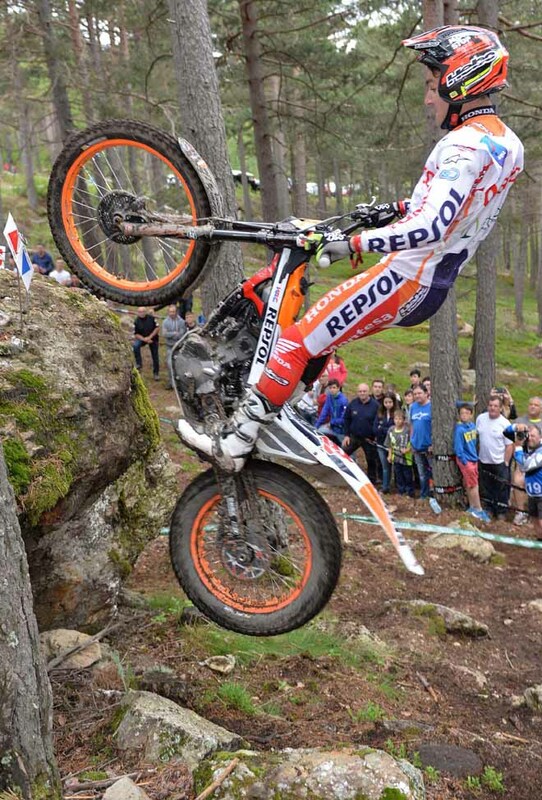 Takahisa Fujinami – Repsol Honda claimed the final podium position although well back from the leading duo. Only eventual fifth placed Albert Cabestany – Sherco escaped incurring time penalties on the long opening laps as the riders literally struggled to come to grips with ultra-difficult sections. Cabestany finished four marks back from Jaime Busto – Repsol Honda who lost out on his first rostrum placing after he fived the very last hazard of the day. The Vertigo pairing of Jeroni Fajardo and James Dabill occupied sixth and seven spots, with the Spaniard this time getting the better of his British team-mate. 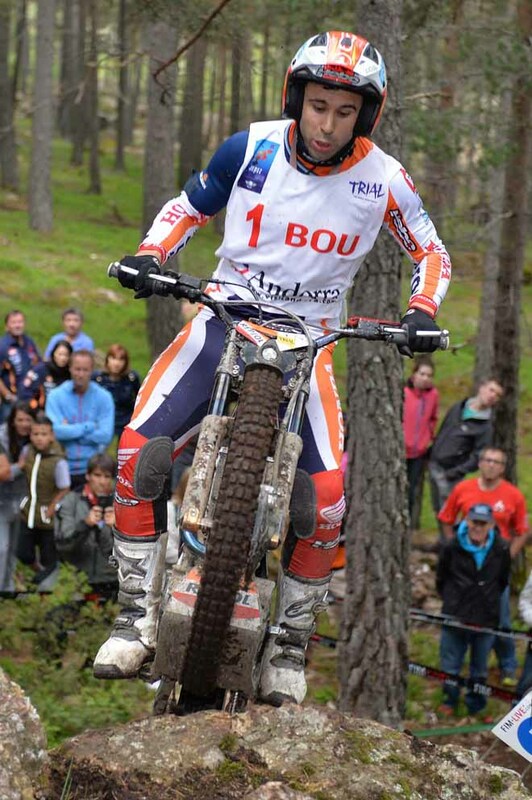 Jorge Casales – Beta made a welcome return to the higher order as he claimed eighth position following a poor run of form leaving the ever improving Miquel Gelabert – Sherco and France’s Alexandre Ferrer – Sherco to define the top ten respectively on the first day of competition in the Andorran mountains. Carry a large smile Bou stated. “After not winning here in Andorra last year I am very happy to take this victory especially as Andorra is now my new home. The rain really made it a tough Trial today and during the first lap I made many, many mistakes including a big crash on the track between the last two sections that damaged the rear wheel of my bike. Lap two was much better, my best riding I think and now I hope I can repeat the same level as this tomorrow and win again.” Bou now leads Raga by fourteen points in the series standings, with another day of battle between this duo in store tomorrow. Jack Price – Gas Gas made it three wins in a row and four in total this season as he again dominated the Trial2 class. On this occasion his margin of victory was twelve marks over French rider Gael Chatagno – Sherco who recorded by far his best result of the campaign to date in second spot. Joining his compatriot on the rostrum, Pierre Sauvage – Sherco made it two French riders in the top three as he secured his second podium finish of the year. Price’s main title riva,l Iwan Roberts – Beta ended the day in fourth as fellow British challenger Dan Peace – Gas Gas rounded out the top five on day one. Price now heads the title race by an ever growing twenty-three points. 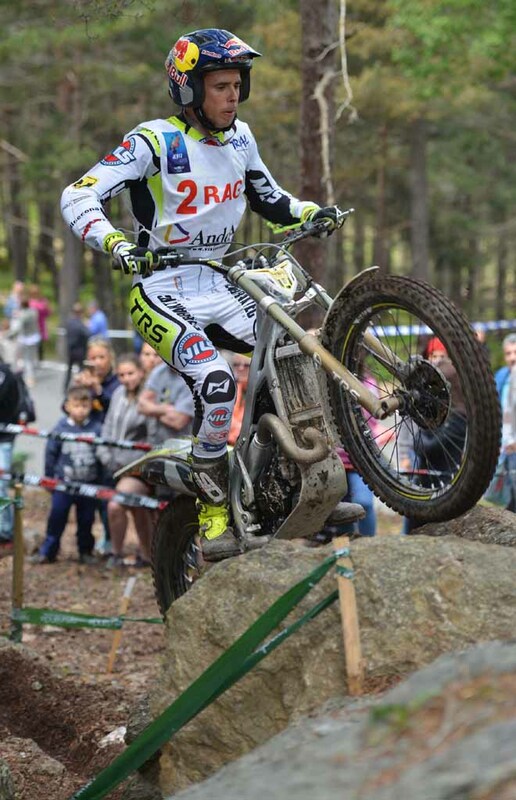 Jack Peace – Gas Gas returned to his winning ways in the Trial125 class on the opening day in Andorra and following his pair of runner’s-up placings at the previous round in Germany. Today marked the fifth win in the 2016 series for the young British rider as he beat his main championship rival Max Faude – Beta by eight marks in what proved to be a tough competition for the Trial125 protagonists. Germany’s Faude ended the day as the clear runner up with eventual third placed Eric Miquel – Sherco from Spain completing the rostrum on day one. Peace has now stretched his lead in the general standings to nineteen points ahead of tomorrow’s Trial. Tomorrow will see the second day of the Trial GP in Andorra, with overnight revisions to some of the sections expected in order to reduce the overall severity of the event whilst also taking into account the changeable weather that was a key factor in making day one such a tough test. Sempre sfida Raga-Bou , risolta nel secondo dei due giri con 18 zone. Grattarola, 11° e Tournour 18°. Nella junior il migliore è Locca ottavo. Petrella nono, Giarba 10°.